What is more important to you when you read a news story on social media: the news agency or reporter who actually wrote the story or the person who shares it? A new study has found that many Americans are more likely to believe information shared by someone they trust. The source of the information is not as important to them. In 2016, the Media Insight Project did a survey about trust and news on the social media service Facebook. It found that two-thirds of Facebook-using Americans said their trust in a news source had an important effect on their belief of the information. Only 48 percent said their trust in the person sharing a story had an important effect on how they much trusted that information. The Media Insight Project decided to set up an experiment to see if these findings were correct. The results of the experiment were different from those in the 2016 survey. The experiment found that a trusted sharer has more of an effect than a reputable media source. In other words, people were more likely to believe news shared by someone they trusted. Many of those questioned did not even remember the source after seeing a Facebook-style post. "If there's somebody I like and agree with, they can have a big influence not only in what I look at, but in whether I believe it or not. I trust them and I convey that trust to the news that they share," said Tom Rosenstiel, executive director of the American Press Institute. Survey organizers write that "people make little distinction between known and unknown (even made-up) sources when it comes to trusting and sharing news." The writers say the findings are important for members of the news media, news literacy activists, and social media networks. There has been a lot of talk recently about "fake news" -- misinformation spread through social media and news media organizations. 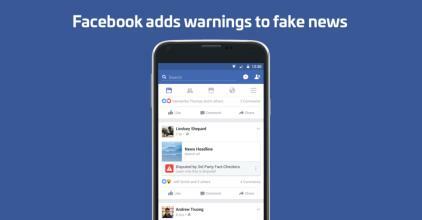 Facebook is now taking steps to call attention to fake news stories. "It's important we give people the tools to make smart decisions about content," said Justin Osofsky, Facebook's vice president of global operations and media partnerships. Critics have suggested that Facebook's decision to identify stories as false, instead of removing them from its website, shows the service is not doing enough. The project's findings show that news organizations should pay attention to how stories spread through social media. They might even want to consider sharing news by competitors in the hope they will do the same, said Rosenstiel. The two sides agreed to set up a commission to investigate claims. The key to the improvement of the quality of courseware is the effective use of every sort of media source. 1.It found that two-thirds of Facebook-using Americans said their trust in a news source had an important effect on their belief of the information. All this military action had an important effect on American popular opinion. Dicarbonyl compounds in wine had an important effect on flavor. 2.Facebook is now taking steps to call attention to fake news stories. They dress in quiet colors so as not to call attention to themselves. It is necessary to call attention to this fact.